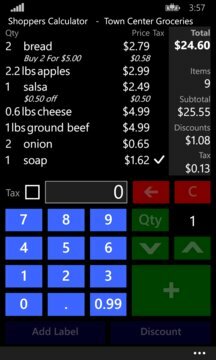 Keep track of your total as you shop. 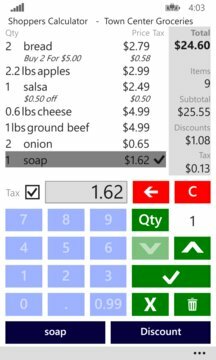 This easy-to-use app features many useful additions such as shopping lists, weight based quantities, labels, many types of discount, sales tax rates (a must have for US based users), shopping history, item statistics, barcode scanning, and landscape and portrait orientations. You'll be able to get started quickly with the familiar calculator style look and feel too!